The Covenant and the Offerings is book 3 of 3 in a series on Exploring the Everlasting Covenant, a curriculum for families rediscovering the biblical Hebraic roots of Christianity. 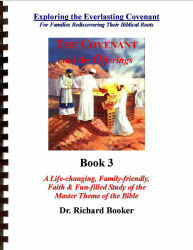 The text material for Books 1-3 is based on the book, "The Miracle of the Scarlet Thread" by Dr. Richard Booker. This is one of the most profound books on the covenant and the blood of Jesus ever written. Published over twenty years ago, it is a worldwide best-selling classic and is considered standard reading for individual believers, churches, Bible schools and family and study groups around the world. What are the Sacrificial Offerings? What is the Sin Offering? What is the Trespass Offering? What is the Burnt Offering? What is the Meal Offering?